Median market rent for US rental housing units rose 4.3% year over year in the first quarter of 2015, according to data released today by the US Census Bureau. All of the gain came in the latest quarter, as rents were nearly flat for the previous three quarters. The first quarter increase compares with an increase of +2.7% in the first quarter of 2014, suggesting some acceleration in rent inflation. Stair step increases are typical of the pattern of the trend of rent increases over the long haul. Since 2000, the compound annual growth rate of rent has been +3.5%. Rents have increased by 76% over that period. In contrast, the BLS imputes the housing component of CPI using an artificial construct called owner’s equivalent rent (OER). This rose by 2.7% over the past 12 months. It has risen by only 43% since 2000. Owner’s equivalent rent accounts for a 24% weight of the total CPI. 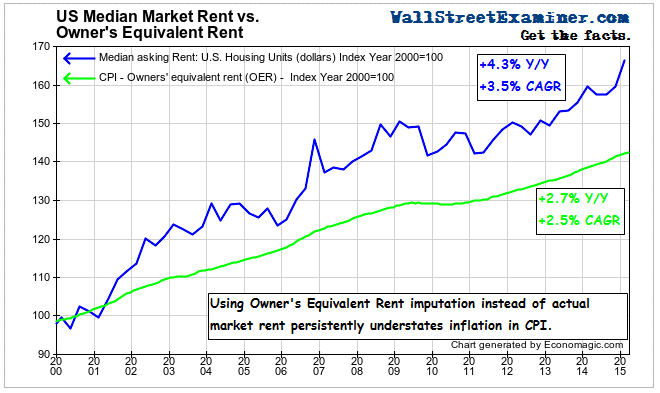 An additional rent component known as Rent of Primary Residence accounts for 7% of total CPI. That was imputed at a growth rate of 3.5% over the past year. The weighted average of the two rent components of CPI was 2.9% for 31% weighting in the total CPI. This compares with actual rent increases of 4.3% as reported by the Census Bureau. That rate is consistent with the rate of rent inflation indicated in several private surveys. Over the past 15 years, the use of this methodology has reduced CPI by an average of 0.3% per year. 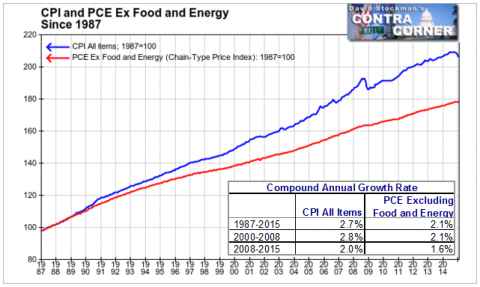 CPI was never intended to be a measure of overall inflation, per se. Its purpose was for indexing government contracts, salaries, and benefits, and for use by businesses for the same purpose. The government uses OER instead of actual rents or actual home sale prices along with hedonic substitution (substituting lower quality items when prices rise) to reduce the cost of CPI escalators in government contracts, wages, and benefit programs. This has saved the US Government countless billions since 1982 when the BLS last included housing prices in CPI. Perhaps there are many who would applaud these tactics, unless you are on the receiving end and seeing the purchasing power of your social security check constantly being eaten away along with seeing the income on your savings smashed to near zero. For middle class elderly, these tricks and ZIRP have been remorseless and brutal. Conomists’ use of CPI as a measure of total inflation is fraudulent. The price of a pound of steak is the price of steak, not hamburger. The price of housing is what it sells for, not what an owner thinks it would rent for. CPI measures only a narrowly defined, hedonically suppressed, narrow basket of consumption items. It excludes the actual prices of housing and other assets which people purchase. The Fed compounds the error of using fake data to understate inflation by relying on an even narrower and more suppressed measure of inflation, the PCE deflator. Neither of these measures account in any way for the inflation of asset prices, and PCE understates inflation even more than CPI. These measures ignore asset inflation completely, and deliberately understate those elements of the indexes which might at least partially represent asset price increases accurately. Here’s a video I did last year explaining the fraud.